The Textiles, Trade & Taste – Portugal and the World is co-organizing this year’s Dressing the Early Modern Network Conference which will be held at the National Museum of Theatre and Dance & National Museum of Costume in Lisbon. The selection committee welcomes abstracts related to specific examples of how science and technology complement other approaches in the interdisciplinary field of early modern dress. Whether looking at innovative conservation treatments, cutting edge technological reconstructions, the digitisation of various sources or optical image recognition, science and technology have helped us to understand and value historical garments and textiles. 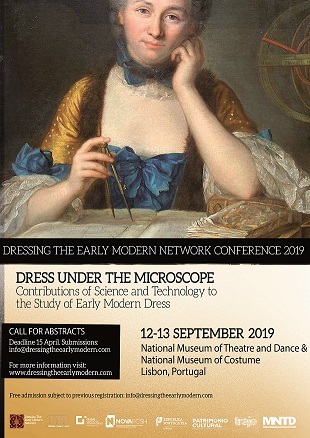 More information about the preparation and submission of abstracts is available at http://www.dressingtheearlymodern.com/Conferences.html. The selection committee will announce decisions by May 15 , 2019. There will be no registration fee for the conference, but previous registration is mandatory via email to info@dressingtheearlymodern.com. Participants will be required to fund and arrange their own travel and accommodation to Lisbon.